The young fighters were waiting for Frances Watthanaya at the gym when she arrived to start afternoon training. The kids looked agitated; something was wrong. Two of the girls, Min and Bee, ran up to Frances when she crested the dirt hill. "Ann can't come anymore," they said. "Her father won't let her train. She wants you to go talk to him. Now!" Frances wasn't totally surprised to hear her Muay Thai student Ann was missing. In Wor. 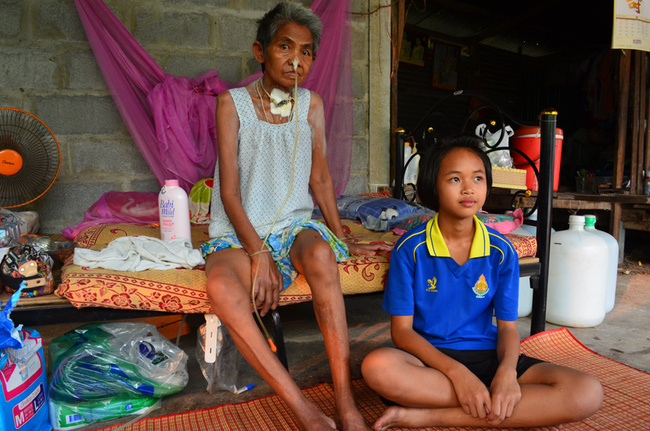 Watthana's two short months of existence, 12-year-old Ann had been one if its most dedicated students, though always against her father's wishes. She had told Frances just a month earlier, "My dad doesn't want me to train because he says I have to help out at home, but I told him if he didn't let me train, I'd drop out of school!" A subversive sparkle had lit up Ann's eyes, and Frances didn't know whether to be proud or concerned. But today Ann was gone, and the gym's other newly minted fighters were worried. Frances decided to reroute their daily run. "Come on," she said to the kids in their local Isaan Thai dialect. "We''ll run to Ann's house." Ann's friends Min and Bee led the way. The young fighters and Frances ran along the backroads between wooden and concrete houses, gathering stares and smiles from the local villagers. 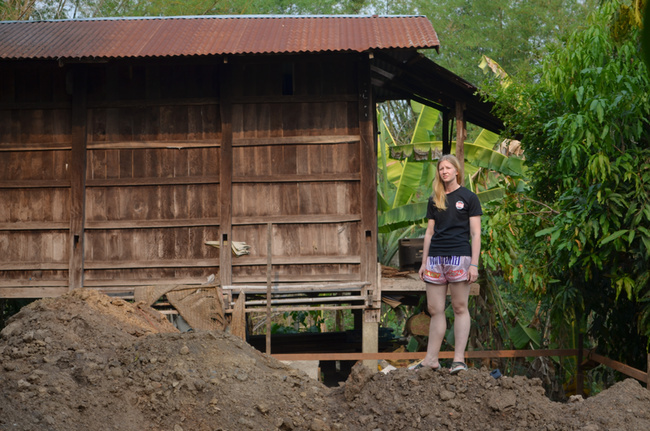 With her blonde hair and fair skin, Canadian Frances stood out against her Thai students. The area residents were familiar with her, though; she had first come to the village nearly 10 years ago with her then-boyfriend Boom, a local Thai whom she'd met while training in Bangkok and later married in this same town. Frances and Boom had been talking about opening their own gym for years. 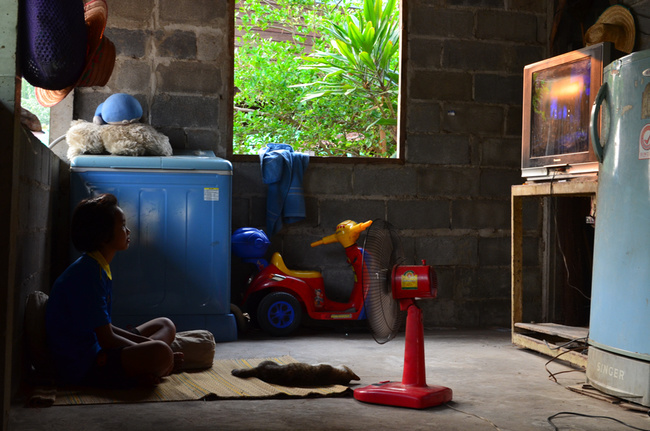 After 10 years away in Bangkok and Canada, Boom returned home to his village last year, disheartened by its utter lack of development. The roads were still unpaved. The kids still had the same drug and gang problems, the same severely limited opportunities. After Boom was offered a wage increase at a new job training in Malaysia at the end of 2014, he and Frances decided the time was right to build their own gym in his hometown. Like most grassroots gym, Wor. Watthana started slowly. Frances enlisted the help of her old trainer Dam to help her prepare for an upcoming fight. They met for padwork daily in the front yard of her father-in-law's house, near where Dam, homeless at the time, was staying with relatives. Local villagers wandered by to watch the pair train. Kids started showing up and asked if they could train too. Though she benefitted from the one-on-one attention, Frances felt it was a waste of Dam's time and talent to be training only one person. Hoping that opening a gym and appointing him as the head trainer would give Dam stable employment and the motivation to stay sober, as well as give the local kids a safe place to come after school, Frances ordered a bag and told the kids to come train. About a dozen kids started show up consistently. Soon older members of the community came too, ex-fighters or fathers of the kids, and told Frances they wanted to help out. No money was exchanged. The kids trained for free. When Wor. 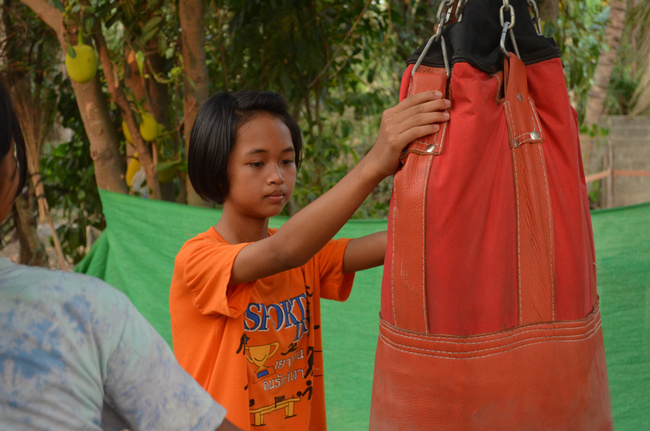 Watthana entered their young fighters into their first local fights, the kids kept their entire purses. Children who wanted to train but had no interest in fighting were also welcomed -- unlike most gyms that work to develop fighters for profit, fighting is encouraged but not mandatory at Wor. Watthana. But the gym was just a dirt patch in Boom's father's front yard. No roof, no mats, no showers or flush toilet, definitely no ring. Frances's savings and Boom's salary from teaching in Malaysia were covering the day-to-day costs of running a gym and taking the kids to fight nights, but they needed a ring and a roof. Frances and Boom's old Bangkok gym owner gave them some advice about running a gym last time they visited the capital. "You can't register your gym with the Sports Authority unless you have a ring," he told them. "And you can't sign fighters or bring your kids to fight on bigger cards unless you're registered. So get a ring. And do it fast. It'll keep the kids motivated and the parents pleased." Frances and Boom initiated a GoFundMe campaign online in hopes that the international Muay Thai community would donate. The campaign was successful, and construction soon commenced on Boom's father's land. In the meantime, the fighters still train on rough carpets spread over the dirt yard and use equipment donated by supporters. Basic conditions aren't a deterrent for the kids; they still show up every day. Less than 15 minutes out from the gym, Frances found Ann sitting next to her frail grandmother on the concrete floor of her family's ramshackle home. Ann's face brightened when Frances approached, as if she'd been waiting for her. Nae, Ann's father, put down the dishes he was washing and faced Frances. The gym kids hung back and watched the exchange from a respectful distance. "Ann can't train anymore," Nae said. "I need her at home. My sister is pregnant and my mother is sick. Ann needs to care for her younger sister too, and I have another on the way. Ann is the only one I can count on. Her mother is gone. She abandoned the family and left Ann and me alone." This was Frances's first time at Ann's home. She'd never seen the tin roof or concrete floors on which Ann slept, never knew Ann lived in a three-room home shared among nine people. The afternoon sun was just beginning to descend. Ann had been allowed to attend training primarily because her father was never home to prevent her from going. He worked late as an unskilled laborer, sometimes as late as midnight. Today, though, he had finished work early, told Ann to stay home where she belonged. "All I need is three hours a day with her," Frances said. "No," Nae said. "I need her at home." "This could change her life," Frances pleaded. "We have people supporting us. We have foreigners donating money and equipment. She'll get proper training at my gym. She'll be cared for." Ann's father wavered, put down the hose he was using to wash the pots. Frances continued, told Nae to think about the future, not just what is going on in the moment. "At her age and weight, it's a very good time to start a career. If she waits until she gets older and bigger, it'll be harder to find good match-ups. This is a perfect age for her to start." Ann's father shook his head. "It's just too hard. There's no one at home to take care of my mother. My sister can't do it; she's about to have a baby." "Think about what's best for her," Frances said. She told him training at Wor. Watthana would open doors for his daughter. Ann would be able to travel and fight, see things outside of their village. She'd be exposed to English through Muay Thai. She'd meet and connect with other girls her age who have similar goals. "You know about the gang and drug problems in the village," Frances said. 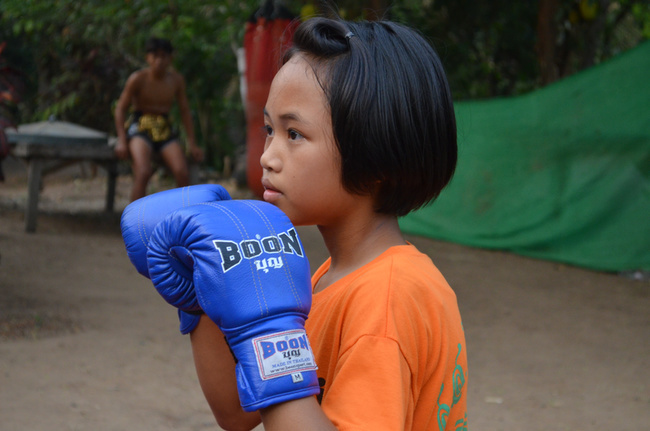 "I truly believe Muay Thai will help protect these girls." She pointed to Bee and Min, Ann's friends standing across the yard with the other kid fighters. "Muay Thai will give them confidence. It'll give them a safe space, and a group of boys and men and women, a community, that respects them and will take care of them." Ann's father considered it. He sighed, then asked Frances, "Is she even any good?" "Yes," Frances said immediately. "She's one of the best we've got." He trained his eyes on the ground for a long moment, then faced his daughter and said, "Do you want to fight?" "Okay," he said to Frances. "You can have her." Ann beamed, ran into the house and changed into her Muay Thai shorts. Her father laughed. While Ann was getting changed, Nae told Frances he remembered her husband Boom from his fighting days nearly 20 years ago. "Is P' Dam still around?" he asked, referring to Frances's trainer Dam, one of the founding members of Wor. Watthana. "Yeah, he's around." She told him Boom and she wanted to start the gym in part to give him a steady job and a way to pass on his Muay Thai knowledge to the next generation, but that he'd turned to drinking again. "He's not at the gym right now," she said sadly. "He was having problems with the kids, yelling at them, yelling at their parents. He got drunk and cut down our only bag. Told one of the beginner kids he'd never amount to anything and made him cry." "Sounds like P' Dam," Ann's father said and shook his head. "Same as what I remember from when I was a kid. He used to take us to fights back then. He was always drunk and causing problems." Ann emerged with her Muay Thai shorts on, ready to train. Her father smiled as he saw her, told her to go to the gym and work hard. Frances thanked him, gave a parting wai gesture of respect to an overburdened man working to keep together his fractured family. The pack of fighters ran back to the gym, now with one extra girl in tow. Around dusk, the kids finished training and dispersed back to their homes in the village. Frances told me what had happened at Ann's home that afternoon. "I don't think I would have gone after Ann if it hadn't been for all the support we've been receiving," she said. 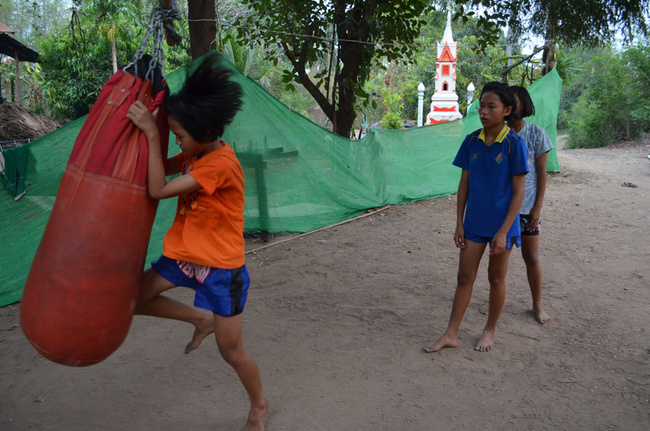 "I can't tell Ann's father, 'Just give me three hours a day so your daughter can roll around in the dirt,' but now that I know our campaign worked and that we have so many sponsors in the Muay Thai community all over the world, I can tell her father with confidence, 'We can take care of your daughter. We will build a gym, put a roof over her head, and give her the proper conditions for training.'"